Last night we’d had the HP2 out until the wee-hours bedding it down snug at the hotel, during our variant of Sportbike West. Why pay $55.00 for a dodgy dinner and thirty-minutes of entertainment when you can hang out with friends and catch up on drinking. 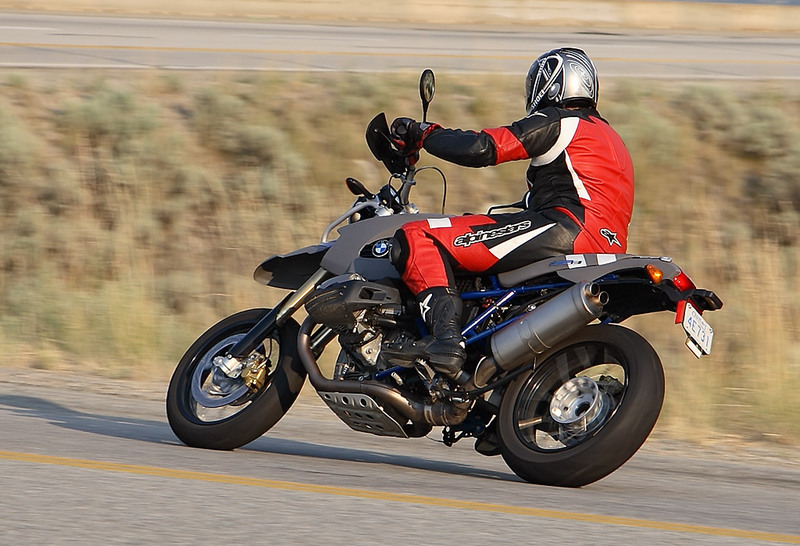 This morning, even as I fool around in the hotel parking lot with the heavy dry clutch (man, feathering at low speed is a clunky workout) and play at getting a motard foot down, I realize that drinking part of the equation should have been given a miss. I’m blurry, bushed and run down… I need a shot of adrenaline. We’ve dubbed it “L/max”, a lawyer’s version of maximum velocity, and it’s posted on the bars on a small oval sticker that in an artful font reads “V/Max 160kph”. Technically the sticker is for the “knobbies”, but I somehow managed to miss it – about 20kph ago. I blame it on the BMW R-type engine pulling so strong in the later stages of its rev range. There is a reprehensible glee in traveling this kind of speed on a big “Enduro”, even if it’s proving to be stable and relaxed. What speed I’m really traveling is in question, the speedo may have been affected by the change in tires so indicated shouldn’t necessarily be trusted. 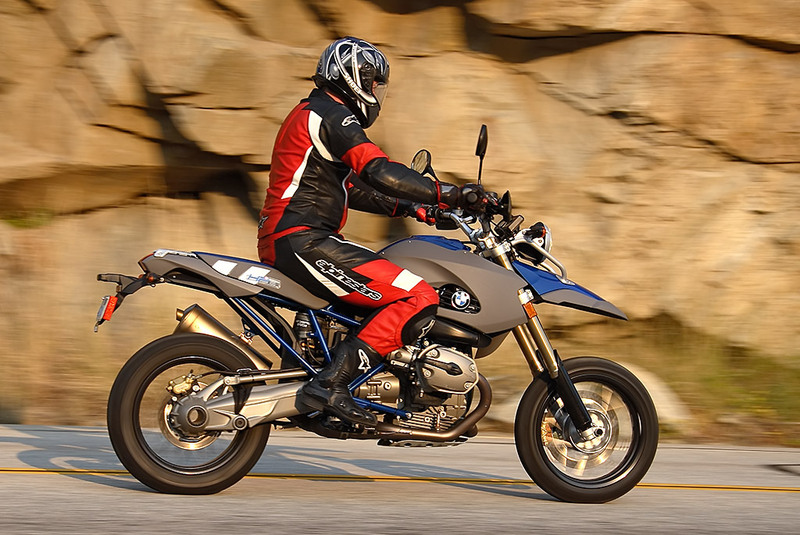 At a claimed 77 kW (105 bhp) and 115 Nm (85 lb-ft) at 5,500rpm maximum torque, the HP2 can go toe-to-toe on the Muscle Beach of Adventure Tourer, Super Motard and Enduro horsepower, and come away kicking sand in those other weaklings’ faces. 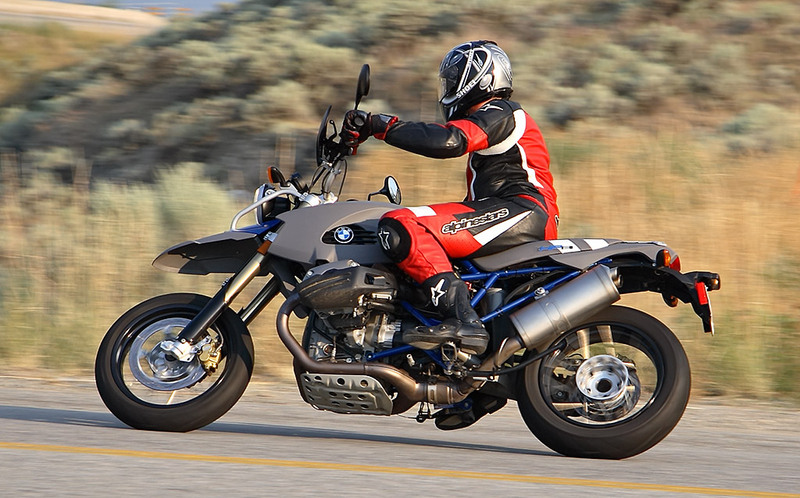 Though at 196.5kg (433lbs) with a full tank, the HP2 needs that sort of stomp. 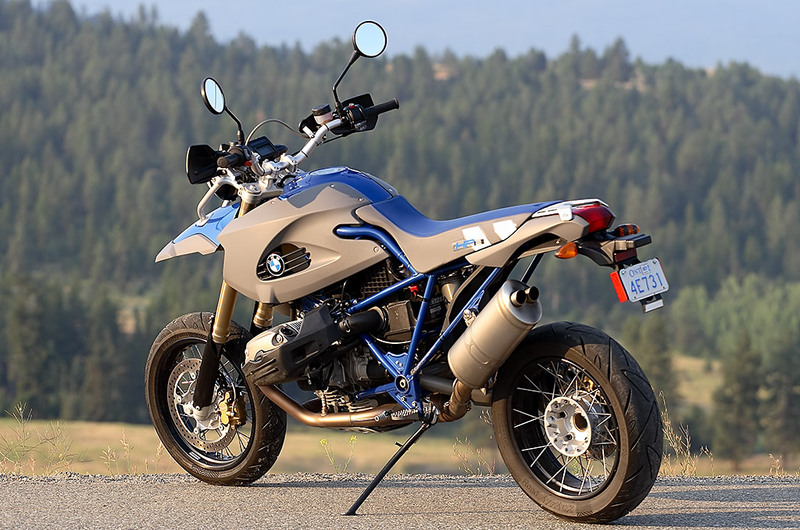 The R-type engine is vibby and alive in this bike, and a lower weight than its other similarly powered siblings, the R1200GS and R1200R, leaves the HP2 feeling more sprightly on the road. There is still a smooth range to the plant, likely in around 4-5000 RPM, but who can tell? There is no tachometer to give away such secrets, too much weight. Indeed, in the HP2 BMW has bared all. Stripping the bike of the usual array of multi-syllabic gadgetry, such as anti-lock, servo-activated, semi-integral braking systems and tele-lever suspension, revealing a spirit and soul more appropriate to drunken romp through Oktoberfest than city streets. If top speed is the outcome of an interaction involving the factors of horsepower (engine speed times torque), gear ratios and tire size, weight and aerodynamic efficiency, then I know the HP2’s biggest limiting factor to be the latter. At the sort of speeds that require a “get out of jail free card” you’re hanging on desperately, helmet being pulled upwards and neck muscles straining, it’s better then to slow off and do what the HP2 does best… corners. Not that he needed to stand, the street shod HP2 features deceptive ergonomics. What looks to be an offensive blue-and -ray-plastic-wedgy of a seat reveals itself to be forgiving, if not actually plush. The bars are wide, and comfortable to grip. Hand guards shield your hands from bush, bugs and potential impacts. 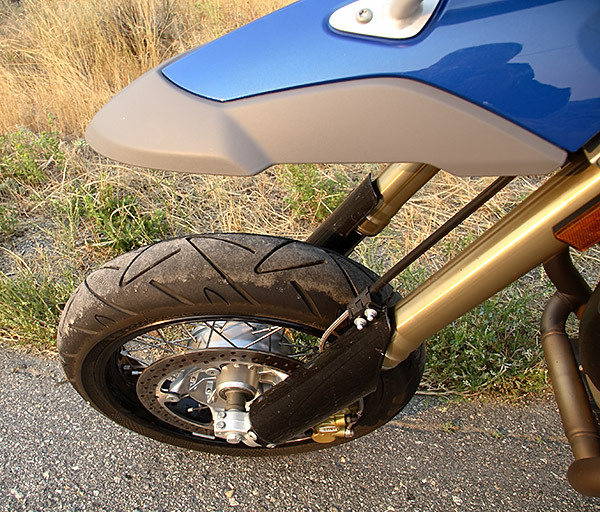 Your legs are spaciously stretched out in a way that makes sport riders weep with jealousy – though if you’re shorter than 6’2″, flat-footing the HP2 at a stop might be an issue. Once seated, though, your feet are firmly planted by the chewy teeth on the pegs. And your upper body is protected by… well, nothing – it all sort of falls apart there. At minimum a flyscreen is needed in the street configuration, because the headlight serves no purpose deflecting the wind. Actually, the lone headlight just serves no purpose. During night riding it is disappointingly dim, providing just enough illumination for straining eyes to eke out the roadway. The headlight may be in keeping with the HP2’s minimalism but the sparseness works everywhere else. Did I miss BMW’s whining, wooden feeling servo-assisted braking so prevalent to the rest of the line, over the HP2’s more conventional system? Not for a moment. The feel of the single-disc 305 mm brake up front and actuated though steel braided lines, you know they are steel braided because the front one runs intrusively across the instrument cluster reminding you, is progressive and linear. I’d take this over the more complicated semi-integral system any day. 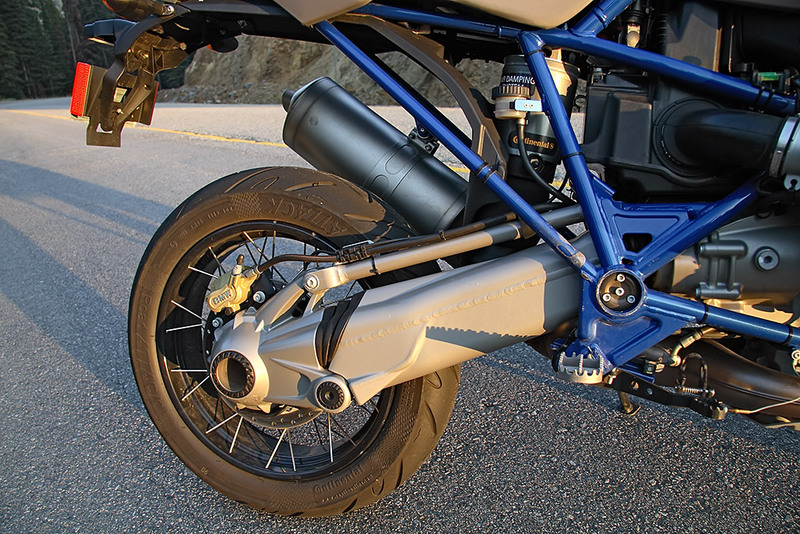 Out back the 265 mm rear disc and swing-caliper setup is carried over from the R1200GS, but is only fed by regular rubber lines – providing a softer feel for the dirt. That feel can be firmed up, by flipping down a chock, effectively raising the height of the rear lever for road use – very bright, except the one on our tester had seized with corrosion. Concerned by the numbers those brakes are carrying, or just bored by them? 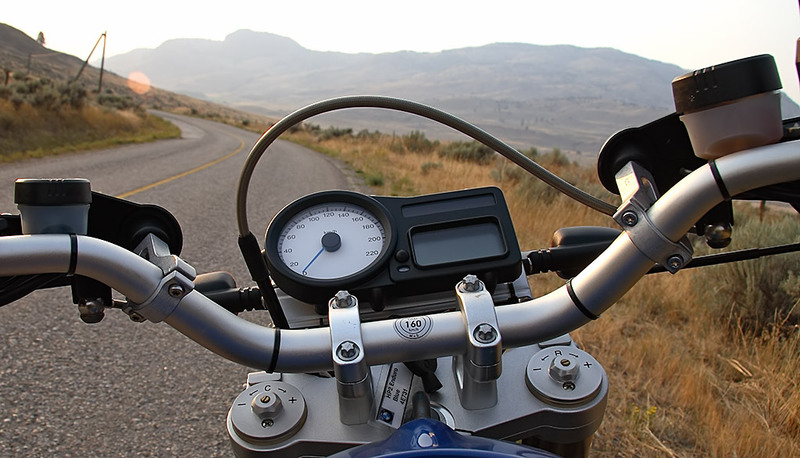 Here’s what you really need to know, the setup is ample for road riding – even emergency stops. 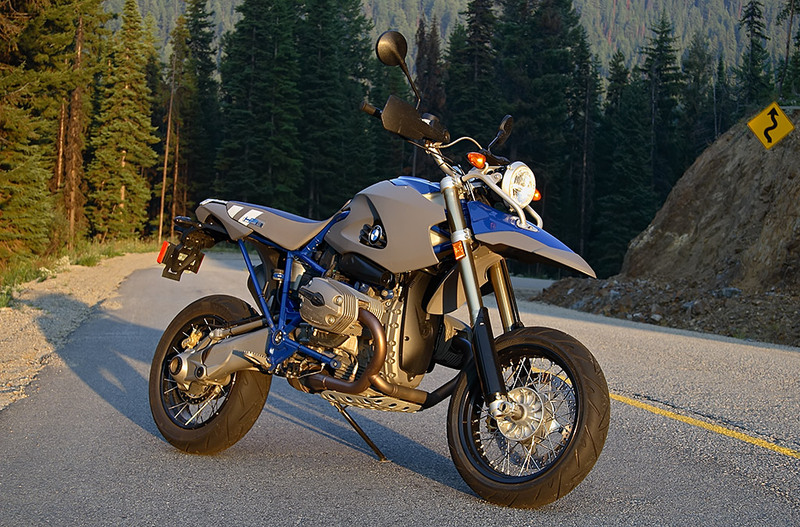 Without ABS the front brake can be locked and the HP2 brought to screeching to a halt in traffic. Oh the things I do in the name of “testing”. Even here, though, the HP2 proves an exceptionally manageable package because the feel of the front brake tells you exactly what is going on, right up to the limit. One thing you should be prepared for is the amount of front-end dive with front disc under full bite, any deeper and you’d need a shovel. This is a trail bike at heart, and that means a lot of travel – heart-stopping amounts. Until I’m used to it I find myself going into corners hot. Then coming out the other side, thinking that the speed was ridiculously easy. For something fine-focused, the HP2 is remarkable friendly and easy to ride – most superstars aren’t this easy to get along with. Indeed, it’s downright accommodating, especially when the road gets rough, the long traveling suspension just lapping up the chaos below. Photographer Kevin has found a must have photo-stop for the Moto Guzzi Griso he’s accompanying me on, I’ve found something better – an empty under construction housing development. Tight winding suburban roads and 90-degree turns, all devoid of cars, kids, and police – the HP2 has the run of the place. The front comes up in second gear on a straight… A foot goes down in a corner, the HP2 swings around as if on a string… We hit the gravel – torque breaks the rear end loose, letting it slide about and we power out… The 1170cc horizontally opposed twin thrums and growls, more alive here than in any other beemer. Cul-de-sacs become spiraling decreasing radius turns. Stop signs – smirk, right! Signaling my intentions with BMW’s unique switchgear – merrily ignored. Clumsy slow work with the heavy clutch is ditched for a delirious comedy of cornering and hooliganism… and suddenly with all the grins I don’t care that it’s 7:30 in the morning – sleep deprivation has never been so much fun! That sense of fun is key to the HP2 in street garb, because if you don’t understand its nature the bike will completely fail to make sense. 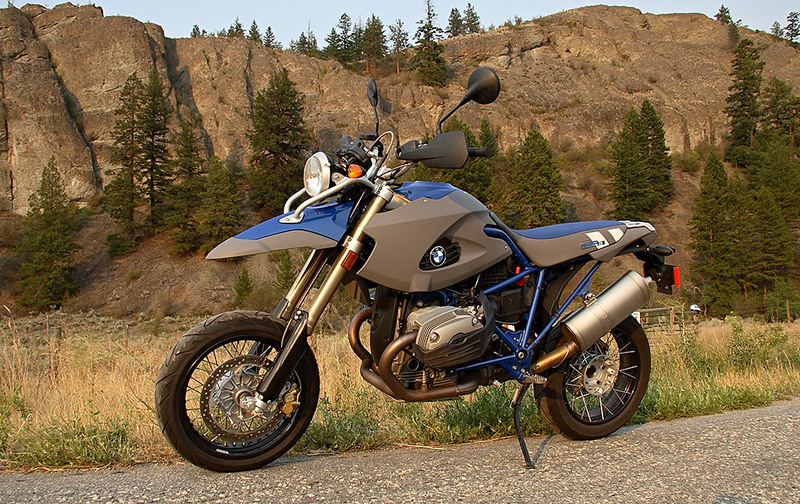 After returning the bike to the BMW demo trailer in Oliver this was exercised in spades talking to one dealership owner. “Almost all of our HP2 customers have bought the street kit. Why buy an HP2?” implying it’s a dirt bike. You could say something about “versatility”. With the kit you suddenly have a bike that’s as good on the road as it is off, even better perhaps. You could argue that once you’ve paid $23,000 CDN (MSRP) for an enduro, that 2500.00 for a set of street tires, rims, and disks (just bolt and go) isn’t that much. Those are just rationalizations for something completely absurd, in the guise of a Teutonic Tard the HP2 is kinesthetic equivalent of slapstick to ride and that’s all the reason you need. To figure out the “logic” only takes a couple of corners. By 9:00AM I’m spent, almost 450kms of B.C.’s most convoluted roads, and more than a few straights, have fallen under the HP2’s rear tire since we picked it up last night. Not nearly enough for my tastes. Out on the highways the HP2 bounds along like a big golden retriever happy to see you; twist the throttle in the upper RPMs and it will bound away from traffic like that big golden retriever just stuck its tongue into a 220-volt socket. In lobbing through the corners, the HP2 demonstrates how a bike can turn a sane, barely-awake man into a juvenile delinquent so hopped up on torque you’d think he was coming back from a rave. Does it make any sense slapping road tires onto one of the world’s priciest Enduros? Nope, not a lick! But then sleep deprivation and the HP2 have something in common, they both affect judgment… but one will leave you infinitely less grouchy and with a Cheshire smile.